The market as we know it, is now finished. As of last night, stocks are nothing but a policy tool, controlled exclusively, and very much legally and with no legislative control, by Ben Bernanke. The Federal Reserve has rendered the economy irrelevant. We hope America enjoys paying $10 for a loaf of bread shortly. 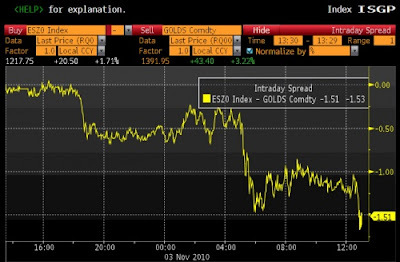 In the meantime, the market closed down 1.5% priced in gold, which closed $7 dollars short of $1,400. Next stop: $10,000.